Have you heard of Google’s Native Client (NaCl) project? Probably not. Basically, it allows native code modules to run inside a browser (where ‘browser’ is defined pretty narrowly as ‘Google Chrome’ in this case). Programs are sandboxed so they aren’t a security menace (or so the whitepapers claim) but are allowed to access a variety of APIs including video and audio. The latter API is significant because sound tends to be forgotten in all the hullabaloo surrounding non-Flash web technologies. At any rate, enjoy NaCl while you can because I suspect it won’t be around much longer. After my recent work upgrading some old music synthesis programs to use more modern audio APIs, I got the idea to try porting the same code to run under NaCl in Chrome (first Nosefart, then Game Music Emu/GME). In this exercise, I met with very limited success. This blog post documents some of the pitfalls in my excursion. This generates something that can be built using a simple ‘make’. When I added Nosefart’s C files, I learned that the project Makefile has places for project-necessary CFLAGS but does not honor them. The problem is that the generated Makefile includes a broader system Makefile that overrides the CFLAGS in the project Makefile. Going into the system Makefile and changing "CFLAGS =" -> "CFLAGS +=" solves this problem. Still, maybe I’m the first person to attempt building something in Native Client so I’m the first person to notice this? At least the process to create an audio-enabled NaCl app is well-documented. Too bad it doesn’t seem to compile as advertised. According to my notes on the matter, I filled in PPP_InitializeModule() with the appropriate boilerplate as outlined in the docs but got a linker error concerning get_browser_interface(). Obviously, the straight C stuff is very much a second-class citizen in this NaCl setup. Fortunately, there is already that fully functional tone generator example program in the limited samples suite. Plan B is to copy that project and edit it until it accepts Nosefart/GME audio instead of a sine wave. The build system assumes all C++ files should have .cc extensions. I have to make some fixes so that it will accept .cpp files (either that, or rename all .cpp to .cc, but that’s not very clean). You’ll be happy to know that I did successfully swap out the tone generator for either Nosefart or GME. Nosefart has a slightly fickle API that requires revving the emulator frame by frame and generating a certain number of audio samples. GME’s API is much easier to work with in this situation — just tell it how many samples it needs to generate and give it a pointer to a buffer. I played NES and SNES music play through this ad-hoc browser plugin, and I’m confident all the other supported formats would have worked if I went through the bother of converting the music data files into C headers to be included in the NaCl executable binaries (dynamically loading data via the network promised to be a far more challenging prospect reserved for phase 3 of the project). I wouldn’t say so. I developed it on Linux and things ran fine there. I tried to run the same binaries on the Windows version of Chrome to no avail. It looks like it wasn’t even loading the .nexe files (NaCl executables). As I was working on this project, I noticed that the online NaCl documentation materialized explicit banners warning that my NaCl binaries compiled for Chrome 11 won’t work for Chrome 12 and that I need to code to the newly-released 0.3 SDK version. Not a fuzzy feeling. I also don’t feel good that I’m working from examples using bleeding edge APIs that feature deprecation as part of their naming convention, e.g., pp::deprecated::ScriptableObject(). Ever-changing API + minimal API documentation + API that only works in one browser brand + requiring end user to explicitly enable feature = … well, that’s why I didn’t bother to release any showcase pertaining to this little experiment. Would have been neat, but I strongly suspect that this is yet another one of those APIs that Google decides to deprecate soon. I eventually got a second wind and made this work using the C interface. I tried to recall how this screenshot came to exist. Had I actually created a functional KDE frontend to Nosefart yet neglected to release it? I think it’s more likely that I used some designer tool (possibly KDevelop) to prototype a frontend. This would have been sometime in 2000. However, this screenshot prompted me to revisit Nosefart. 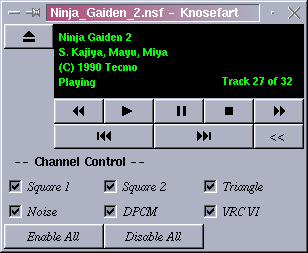 Nosefart is a program that can play Nintendo Sound Format (NSF) files. NSF files are files containing components that were surgically separated from Nintendo Entertainment System (NES) ROM dumps. These components contain the music playback engines for various games. An NSF player is a stripped down emulation system that can simulate the NES6502 CPU along with the custom hardware (2 square waves, 1 triangle wave, 1 noise generator, and 1 limited digital channel). Nosefart was written by Matt Conte and eventually imported into a Sourceforge project, though it has not seen any development since then. The distribution contains standalone command line players for Linux and DOS, a GTK frontend for the Linux command line version, and plugins for Winamp, XMMS, and CL-Amp. The Sourceforge project page notes that Nosefart is also part of XBMC. Let the record show that Nosefart is also incorporated into xine (I did that in 2002, I think). When I tried running the command line version of Nosefart under Linux, I hit hard against the legacy audio API: OSS. Remember that? In fairly short order, I was able to upgrade the CL program to use PulseAudio. The program is not especially sophisticated. It’s a single-threaded affair which checks for a keypress, processes an audio frame, and sends the frame out to the OSS file interface. All that was needed was to rewrite open_hardware() and close_hardware() for PA and then replace the write statement in play(). The only quirk that stood out is that including <pulse/pulseaudio.h> is insufficient for programming PA’s simple API. <pulse/simple.h> must be included separately. For extra credit, I adapted the program to ALSA. The program uses the most simplistic audio output API possible — just keep filling a buffer and sending it out to the DAC. I’m not sure what to do with the the program now since, during my research to attempt to bring Nosefart up to date, I became aware of a software library named Game Music Emu, or GME. It’s a pure C++ library that can essentially play any classic video game format you can possible name. Wow. A lot can happen in 10 years when you’re not paying attention. It’s such a well-written library that I didn’t need any tutorial or documentation to come up to speed. Just a quick read of the main gme.h header library enabled me in short order to whip up a quick C program that could play NSF and SPC files. Path of least resistance: Client program asks library to open a hardcoded file, synthesize 10 seconds of audio, and dump it into a file; ask the FLAC command line program to transcode raw data to .flac file; use ffplay to verify the results. I might develop some other uses for this library. I wanted to crawl Google in order to harvest a large corpus of certain types of data as yielded by a certain search term (we’ll call it “term” for this exercise). Google doesn’t appear to offer any API to automatically harvest their search results (why would they?). So I sat down and thought about how to do it. This is the solution I came up with. Q: Is this legal / ethical / compliant with Google’s terms of service? Google returns up to 1000 results for a given search term. Fetching them 10 at a time is less than efficient. Fortunately, the search URL can easily be tweaked to return up to 100 results per page. Problem: 1000 results for the “term” search isn’t that many. I need a way to expand the search. I’m not aiming for relevancy; I’m just searching for random examples of some data that occurs around the internet. My solution for this is to refine the search using the “site” wildcard. For example, you can ask Google to search for “term” at all Canadian domains using “site:.ca”. So, the manual process now involves harvesting up to 1000 results for every single internet top level domain (TLD). But many TLDs can be more granular than that. For example, there are 50 sub-domains under .us, one for each state (e.g., .ca.us, .ny.us). Those all need to be searched independently. Same for all the sub-domains under TLDs which don’t allow domains under the main TLD, such as .uk (search under .co.uk, .ac.uk, etc.). Another extension is to combine “term” searches with other terms that are likely to have a rich correlation with “term”. For example, if “term” is relevant to various scientific fields, search for “term” in conjunction with various scientific disciplines. My solution is to create an SQLite database that contains a table of search seeds. Each seed is essentially a “site:” string combined with a starting index. Each TLD and sub-TLD is inserted as a searchseed record with a starting index of 0. Sometimes, Google notes that certain sites are particularly rich sources of “term” and offers to let you search that site for “term”. This basically links to another search for ‘term site:somesite”. That site gets its own search seed and the program might harvest up to 1000 URLs from that site alone. This step is easy to parallelize by simply executing multiple copies of the script. It is useful to update the URL table to indicate that one process is already trying to download a URL so multiple processes don’t duplicate work. Google allegedly doesn’t like automated programs crawling its search results. Thus, at the very least, don’t let your script advertise itself as an automated program. At a basic level, this means forging the User-Agent: HTTP header. By default, Python’s urllib2 will identify itself as a programming language. Change this to a well-known browser string. Be patient; don’t fire off these search requests as quickly as possible. My crawling algorithm inserts a random delay of a few seconds in between each request. This can still yield hundreds of useful URLs per minute. On harvesting the data: Even though you can parallelize this and download data as quickly as your connection can handle, it’s a good idea to randomize the URLs. If you hypothetically had 4 download processes running at once and they got to a point in the URL table which had many URLs from a single site, the server might be configured to reject too many simultaneous requests from a single client. Anyway, that’s just the way I would (and did) do it. What did I do with all the data? That’s a subject for a different post. 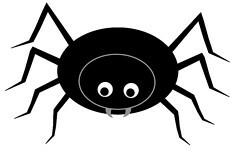 Adorable spider drawing from here. 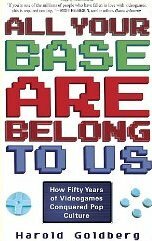 I have been reading through “All Your Base Are Belong To Us: How 50 Years of Video Games Conquered Pop Culture” by Harold Goldberg. Despite the title, Zero Wing has yet to be mentioned (I’m about halfway done). Of course, Graeme Devine created a new FMV format (called VDX, documented here) for The 7th Guest. The player was apparently called PLAY and the book claims that Autodesk was so impressed by the technology that it licensed the player for use in its own products. When I think of an Autodesk multimedia format, I think of FLIC. The VDX coding format doesn’t look too much like FLIC, per my reading. 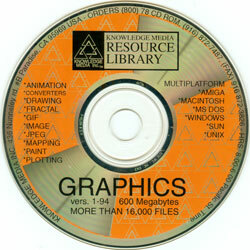 Devine began working on creating software within the CD-ROM disk that would play full-motion video. Within days he had a robust but small ninety-kilobyte player called PLAY that was so good, it was licensed by Autodesk, the makers of the best 3-D animation program at the time. Then Devine figured out a way to compress the huge video files so that they would easily fit on two CD-ROMs. Googling for “autodesk trilobyte play program” (Trilobyte was the company behind 7th Guest) led me to this readme file for a program called PLAY73 (hosted at Jason Scott’s massive CD-ROM archive, and it’s on a disc that, incidentally, I donated to the archive; so, let’s here it for Jason’s tireless archival efforts! And for Google’s remarkable indexing prowess). The file — dated September 10, 1991 — mentions that it’s a FLICK player, copyright Trilobyte software. However, it also mentions being a Groovie Player. Based on ScummVM’s reimplementation of the VDX format, Groovie might refer to the engine behind The 7th Guest. So now I’m really interested: Did Graeme Devine create the FLIC file format? Multimedia nerds want to know! I guess not. Thanks to Jim Leonard for digging up this item: “I developed the flic file format for the Autodesk Animator.” Jim Kent, Dr. Dobbs Magazine, March 1993. The PLAY73 changelog reveals something from the bad old days of DOS/PC programming: The necessity of writing graphics drivers for 1/2 dozen different video adapters. The PLAY73 readme file also has some vintage contact address for Graeme Devine; remember when addresses looked like these? The book didn’t really add anything I didn’t already know regarding the compression format (RoQ) used in 11th Hour. I already knew how hard Devine worked at it. This book took pains to emphasize the emotional toll taken on the format’s creator. I wonder if he would be comforted to know that, more than 15 years later, people are still finding ways to use the format.